Memory of the Argentina Disappearances examines the history of the production, public circulation, and the interpretations and reinterpretations of the Nunca Mas report issued by Argentina's National Commission on the Disappearance of Persons (CONADEP). It was established in 1983 by constitutional president Raul Alfonsin to investigate the fate of thousands of people who had been disappeared by the state during the seventies. Upon publication in 1984, Nunca Mas became a bestseller, was translated into several languages and won greater public importance when the military juntas were brought to trial and the court accepted the report as key evidence. The report's importance was further enhanced with the adoption of CONADEP and Nunca Mas as models for truth commissions established in Latin America, and when it was postulated as a means for conveying an awareness of this past to Argentina's younger generations. 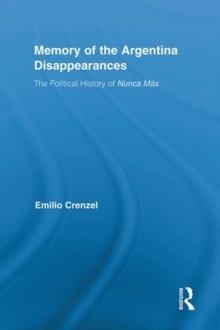 This book contributes to understanding the political processes that led to Nunca Mas becoming the way in which Argentines remembered the disappearances and the country's political violence, and how its meaning is modified by new interpretations. Given the canonical nature of Nunca Mas, the book sheds light on the most substantial changes and the continuities in Argentina's social memory of its recent past.